The Antelope Valley Poppy Reserve State Park is very popular this time of year when the poppies are near their maximum bloom. Laura Molnar had been through here during the weekend and gave it glowing reviews, so I thought I would stop by on my way south to Los Angeles. I had slept a few miles east of the preserve so that it could be my first start of the day. This is not really the best time to see them since they are closed up in the early morning until the sun has had a few hours to warm them. On the plus side, the place isn't very busy at this time (though there were already more than a dozen cars when I arrived on a mid-week morning) and there's no one to collect fees at the entrance kiosk. I wandered the trails around the park for almost two hours. Cross-country travel is prohibited though some visitors can't seem to help wandering into the poppy fields for selfies and close-ups. I hiked the trails to the highest point in the park (Antelope Buttes) at the east end as well as to the lesser Godde Hill on the west side. The majority of blooms were taking place in the eastern half of the park, some quite dense. To the northwest and outside the park, Fairmont Butte had its own display of yellow and gold that was quite impressive from a distance. The trails were occupied by fellow visitors that carried far more expensive camera gear than my own. Only a few were strolling about without a camera in hand. On the southwest edge of Antelope Valley lies the 13-mile long Portal Ridge. It is separated from the main body of the Liebre Range by the Leona Valley and Pine Canyon, an unusually straight alignment of hills and depressions that make more sense when one realizes the San Andreas Rift Zone runs right down the crease of it all. The two summits are located on either side of Munz Ranch Rd which connects Antelope Valley on one side of Portal Ridge with Lake Elizabeth on the other. Lake BM is named for this natural lake, a sag-pond on the famous earthquake fault that is usually perennial except in drought years. I drove a short distance up dirt Ash Tree Dr on the north side of Lake Elizabeth to access Lake BM. A high-clearance vehicle can drive to the antenna-topped summit if the gate, about half a mile from the pavement, is open. Rather than follow the dirt road, I took a more direct route along an older, no longer used track to reach the crest of Portal Ridge. From there it was a short distance west to the highpoint, a little more than a mile from where I started. 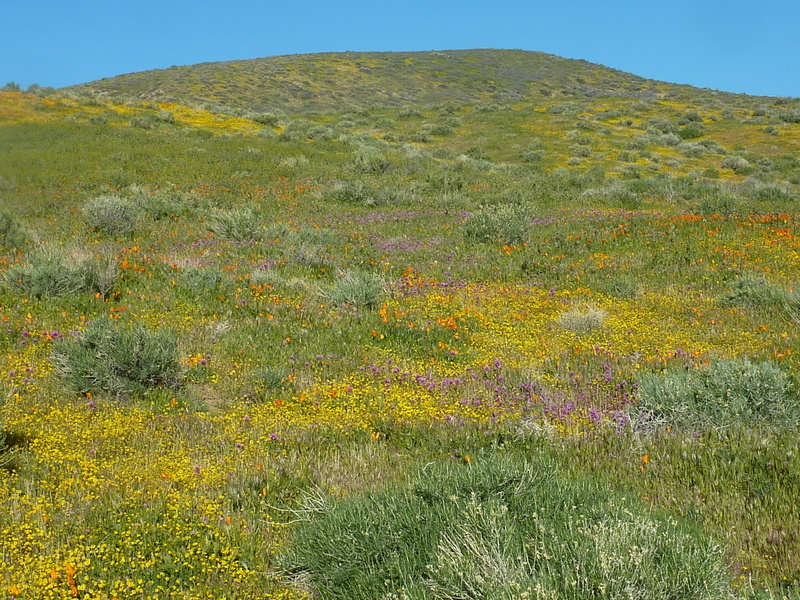 There is a fine view overlooking Antelope Valley with the dense poppy blooms in vivid displays of orange. I took an alternate route down, some cross-country through tall grass, passing by a memorial cross for a 25yr-old Ray Laux who passed a year earlier. The descent slopes had their own brilliant wildflower displays. I next drove east past the main junction of Elizabeth Lake Rd and Johnson Rd, to a small development on the south slopes of Portal Ridge. Parking at the end of Masonhill Rd, I used a dirt utility road going up to the crest and then west to the highpoint at Portal BM. The views here are similar to those on Lake BM, overlooking the Antelope Valley to the north and the San Andreas Rift Zone to the south. Neither summit had any signs forbidding trespassing or fences to block access. The big outing of the day was a collection of five summits along the crest of the Liebre Range between San Francisquito and Bouquet Canyons. A firebreak runs along the crest that can be utilized by motorcycle or foot traffic, while the Leona Divide Truck Trail traverses just below the crest itself on the southwest side. Further down the same side can be found the PCT which makes a much longer path as it circuitously weaves in and out of the many side canyons that populate the lower elevations. I used a combination of the truck trail and firebreak to reach the first four summits on my outbound journey from the summit of San Francisquito Canyon Rd where I parked to the highest point at Granite BM. On the return I took the PCT as a change of pace before tackling the last summit near the end. Overall the PCT was a much slower route because of all the meandering the trail does, but I was glad to have added a new section of this National Trail to my collection. I had originally planned a 10-mile outing that didn't include Granite BM which can be more easily reached from the southeast starting at Lincoln Crest, the summit of Bouquet Canyon Rd. I found the going along the crest of the range so enjoyable that I sort of let it morph into a much longer 17-mile outing that absorbed the rest of the afternoon. I accessed the PCT at a low saddle between Spunky Canyon and Lost Valley, finding a rough use trail connecting the truck trail to the PCT. While plying the PCT I wondered why it traversed so low along the crest rather than the shorter, more scenic route along the crest, eventually concluding it might be to provide access to the small springs that dribble water down a few of the side canyons. On the southeast side of the last summit, Peak 4,067ft, I found a steep connector trail heading up from the PCT to a saddle. Rebar had been pounded into the earth on the trail and old tattered ropes used as handlines to aid up this steep class 2-3 section. I found just having the brush cleared was sufficient. At the saddle I picked up a better use trail along an old firebreak leading to the summit, removing any need for bushwhacking along the entire route. Back at the saddle I went up to the truck trail which I took back out to San Francisquito Canyon Rd, passing by a minor washout that had closed the road to vehicles even though several had found it relatively minor to work around it.